Check out all the apps I run on my rooted Droid X, with a few additional homescreen shots! This took me seriously 9 hours to do. All of the information on the process is spread out over 1000 pages of forum post, with every poster explaining a different way to do it. With that being said, this is what worked for me- it might be slightly different for you. I tried to do the on-phone root process using Android Terminal, which did not work. I also had to repeat a few steps in here seriously 20 times. All told, I think I performed 19 device wipes resetting all my apps, I erased my SDcard, and rebooted my phone over 50 times. Hopefully you will not have to do the same things, it should be straightforward. At the end of this post I will also go over a few things that I have learned in doing this, so that you might be saved the effort of searching through tons of forums for a bit of information here and there. This has nothing to do with SBS 2008, or even Windows. But it’s cool, so I thought I would share my excitement. There will be steps that I glaze over, and instead provide links to walkthroughs. this is not because I am lazy, but because it is already so well explained by the software providers and others that it seems redundant. You might also think- why follow this guide, when these other guides are already written and well put together. Go for it- but it took me a long time, as there was a few steps missing from these guides that I did not pick up on. I will also be keeping images thumbnail size because this post might be long and complex. Please click the images to see full size. Lets root the Droid X, running 2.2.
Credit where credit is due. I rooted my Droid using this site, from Droid-Life.com. Download and install Java JDK SE (Instructions Here). If you are running XP, you might have to download Motorola Drivers. If you are running Windows 7, Windows should automatically find the correct drivers for you by searching the system and Windows Update. At this point you have Java JDK and Android SDK installed. 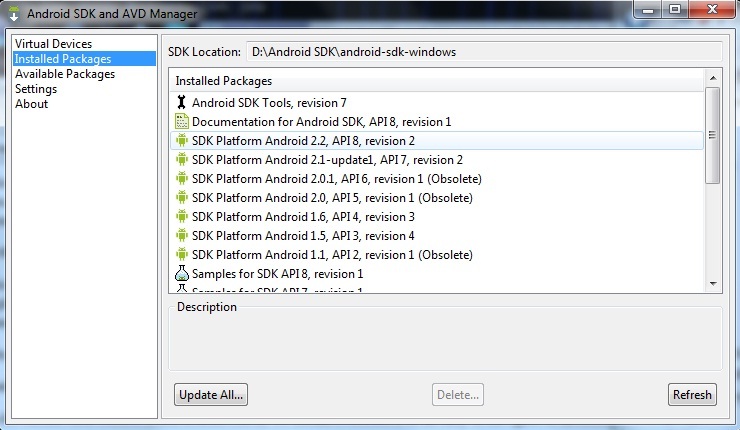 Open the folder that you extracted Android SDK to. On the Install Packages page, make sure to install Android 2.2, Android 2.1, and USB Driver Package. I just installed all of the packages, I got the space. After that is installed, you can exit out of the program. At this time plug in your Droid X. Hit the Notification bar, and click USB Connection. Then select Charge Only. Your computer will install drivers, anywhere from 2 to 6 of them. It can take a while with Windows Update- let it finish. They all need to be successful, if they are not then you need to download them elsewhere, here is a link: 32bit or 64bit. I did not install the packages, I let my phone do the work. What I DID do though was install the Motorola Connect Utility, and let it do its work. This install is also done automatically at some point, I prefer the package. Unplug your phone. Click Menu from the home screen, settings, applications, development. Enable USB Debugging. Now plug back in your phone, making sure it’s still on Charge Only. It will install another bout of drivers. Extract it. Inside the folder you will see 5 files. Copy these into the TOOLS folder in the Android SDK folder. Now this is where I had trouble. If the following command takes too long to connect, close your terminal. Thenh it will list a device, a string of numbers and letters. This is good, means your device was identified. It copies files over, superuser, busybox, and su. 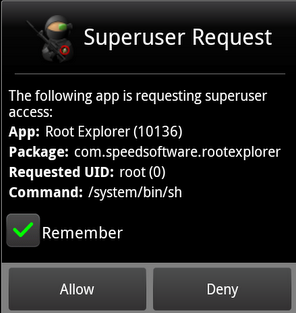 You will get pop ups to grant superuser permission to a few apps: namely ROM Manager and the BootStrapper. Then you will see a message, asking you to restart the adb server and re-login. If you let it sit there for 20 minutes nothing happens. If you go to task manager and restart the process, it just starts over. If you unplug the cord from your Droid, it starts over as well. This is where it takes patience. What finally worked for me was unplugging the USB cord from my computer, for a fraction of a second- I didn’t even take it out. I just broke the connection long enough for it to restart. If it does not work the first time, just keep trying- it will keep rebooting. After 5 tries you might try to reboot your PC and droid, then repeat this process. I rebooted and it does half of a yellow bar in restore mode then boots normally- not rooted as far as I can tell. Go to the Droid Market and download Android Bootstrapper. It costs money, but it makes boot work. Open the app, and click the top button. Eventually, it will work, and you will get to a stage that says press any key to exit. Reboot your Droid, and you are rooted. Yet you won’t really be able to tell. At this point, back up anything you need to. Copy your pictures and music to your PC, use Google and your backup apps to back up your system. 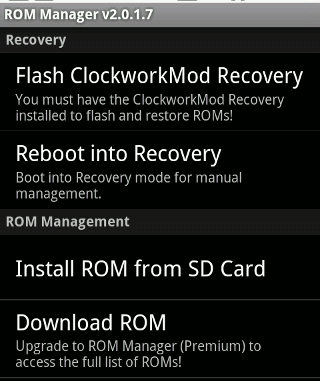 Go to the Android Marketplace, and download ROM Manager. I bought it, because it is one fine piece of work. Once you install that, open it up. Click Flash ClockWorkMod Recovery. Your phone should reboot and enter recovery mode, and you will see the text backing up your system. Then it reboots again. Enter the Rom Manager again. Click Download ROM. 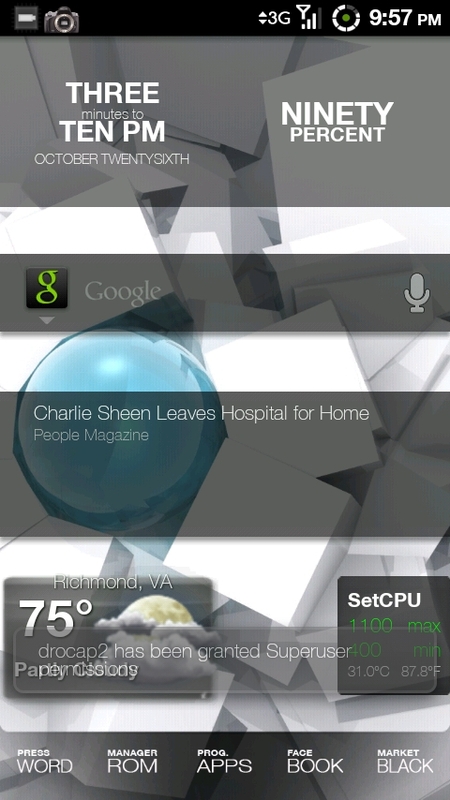 Because I paid for the app, I went to premium>Fabulous> and downloaded ApeX V1.0 for Droid X. You can look through the other choices, there are not a lot of mods for the Droid X in the ROM Manager. Once your ROM downloads, it asks if you want to reboot. Check off both wipe data and backup. Let your phone do work, and when it comes back up you will have the new Rom installed. Here are some things I did not know, going into this. There are not a ton of ROM’s for Droid X.
ROM’s replace features of your phone, they are not the same as themes. While some roms might come with backgrounds, you can change to your own if you wish. Once you install a rom, backup. After the ROM is installed and rebooted, then apply themes and add-on packages, the same way you added the rom. Keep your ROM’s organized, not on the root of the SDcard. The only zip file there should be update.zip. Once you apply the rom, packages, add-ons, themes, THEN customize your apps and desktop. I had to reinstall rom manager about 10 times. When adding themes or addons, you do not generally need to wipe data. Once you have added all of your apps, you can then further theme your phone with a home screen replacement. I use Launcher Pro with ApeX ROM, which I have also installed REVOlution theme on, REVOlution battery icon, and REVOlution font. You can download roms from the internet, save them to your phone, then install them with ROM Manager. THERE ARE OTHER SUPPOSED WAYS TO DO THIS. I WOULD NOT RECOMMEND DOING THE ONE BUTTON ROOT, AS THOSE OFTEN DO NOT WORK OR WORK TO A LESSER DEGREE. THERE IS ALSO THE ANDROID TERMINAL, WITH THE STEPS DOCUMENTED HERE. THIS DID NOT WORK FORM ME, GIVING ME AN EXPLOID ERROR WHICH I COULD NOT SOLVE. All credit to Droid Life, XDA Developers, DarkOnion, Motorola, Android, The developers of Rom Manager, Droid X Bootstrapper, and all the forum post that I read through. A screenshot of my current setup. This is only a warning, and can be disregarded in cases where we know the server is safe. the problem with this is that end-users often do not understand the massage, or even do not read it. When they see this page they call support and complain about the internet being broken. Another bad thing about this error page is that to continue on to the site, you need to hit the red button. Be design, we associate red with stop, not continue.It is easy to get a certificate. We turn in some paperwork to a trusted authority, and they send us a certificate, which we then install. You server, upon creation, generates a private key. This key is what the trusted authority generates your SSL certificate on.My problem with Register.com is that I reinstalled my server. even though I have the same exact configuration, my private key was changed. Which means that my SSL was invalid. And Register.com was reluctant to issue me a new key. They had the special of $15 when I first bought it, though it is now $24. You get what you pay for, but in this case the simplest and cheapest the best. So after shopping around I see Comodo’s Positive SSL, only $9.95.So go to the Comodo website, and click to purchase a 1-year Positive SSL. You will notice the address bar, displaying both a green color, https and a locked symbol. this is what we will achieve with the SSL. Alright, lets generate our CSR for this website. On your server, open Windows SBS Console. 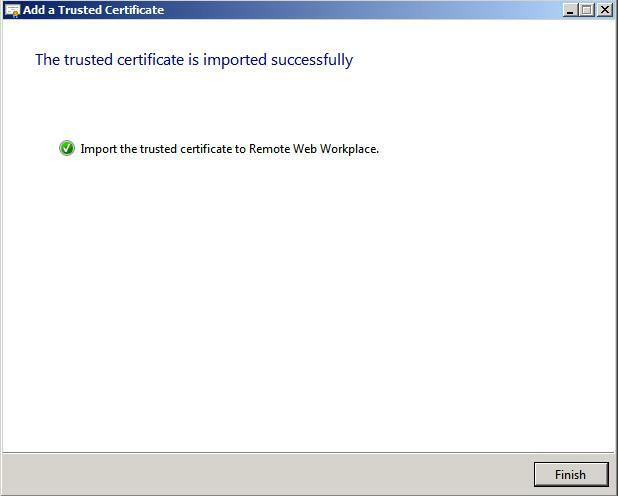 Navigate to Network>Connectivity, and click Add a Trusted Certificate on the left. There is a little disclaimer, click next. 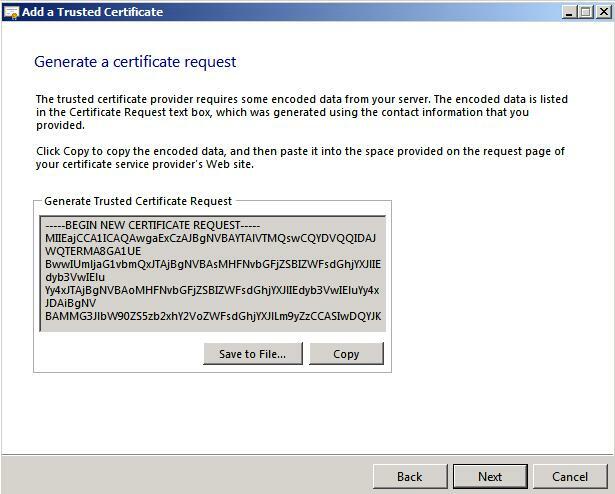 Select that you wish to buy a certificate from a certificate provider. 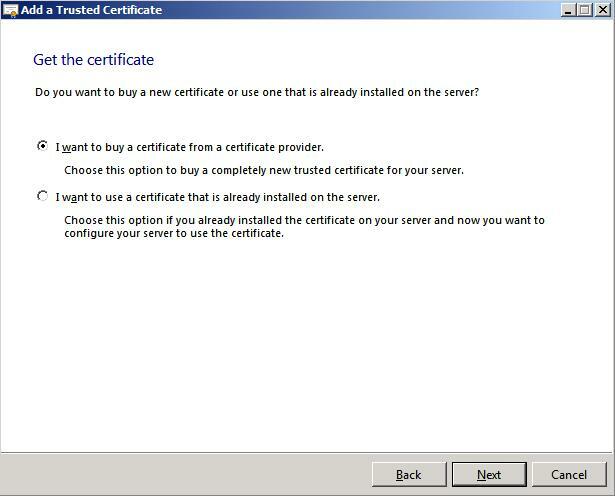 The other option is for if you already have your certificate, and just need to install it. Click next. Fill in the correct info in all of the boxes. This is an important step, and wrong information here might very well ruin the validity of a SSL Certificate. Enter all fields correctly, and write it down for later. Remember that the SSL is accompanying your domain name, which is mycompany.mysuffix. Mine is blankhealthcare.org, and my server added the prefix remote for my RWW and remote services. So I will enter remote.blankhealthcare.org in the Issued To: box, because this is the site I am securing. I blanked out the field to preserve confidentiality. On the next screen, your CSR is generated. You need to copy all of that information that is in the gray box, including the title “—–BEGIN NEW CERTIFICATE REQUEST—–“. Hit the copy button. To be on the safe side, I also save it to a file, and put that file in a safe backup location. 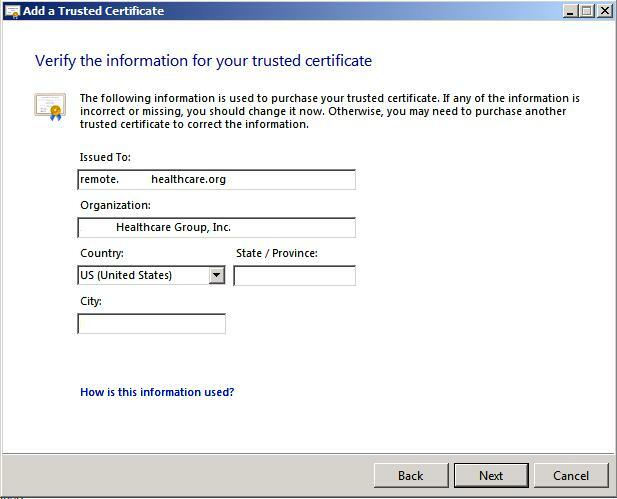 In the next window, it asks if you have the cert, or will add it later. I just leave this box open. Now go back to the Comodo site and paste your CSR in the box they request it in. Select your software from the drop down box. In the case of SBS 2008 it will most likely be IIS 7.x and greater. Click one year. I left the first 3 free upgrades in effect, and did not check the last one. No one will be purchasing on my site. Total cost is $9.95, excellent. Hit next. This next step can be tricky. If you use an external domain to host your website, which then forwards email to your box using MX, the associated email accounts can be tricky. I do a little tricking myself. There is no address admin@mydomain.org, but Ill create a user really fast. then I grant myself full access permissions, and have the email sent there. I access it, and then shut down the account. You can have it sent to any of the other addresses in the list, though I would not suggest messing around with any important emails accounts such as postmaster, hostmaster, or webmaster. Fill in your info. I am going to glaze over this part- if you don’t know how to fill in your own company information in a webform, press Ctrl-Alt-Del, select lock workstation, and go home for the afternoon. They will confirm, and send out a few emails. One email is important. They mail a validation code to the mailbox you specified during set up. Go to Exchange Management Console. Expand user configuration, mailbox. Right click on the account for Admin (or whichever you specified. Click Full Access Permissions. Add yourself. You must be an Exchange Admin to do this. Now log into OWA, in in the top right corner, click your user name. in the box that appears, enter the name of the account you wish to open. Then read the email. Copy down the validation code. Click the link to enter the code, and paste it into the box. You will receive a confirmation. Wait for the email to be sent. It can take a little while to arrive. EDIT: At this point, after I validated I waited for one hour. I know the process takes a while, but I was eager to apply the certificate. So I entered a live chat on the Comodo website. After being transferred to a tech named “Jake”, he stopped responding. I gave him 8 minutes to reply to my question, before I hung up and emailed EVValidation. They received my ticket at 12PM…. 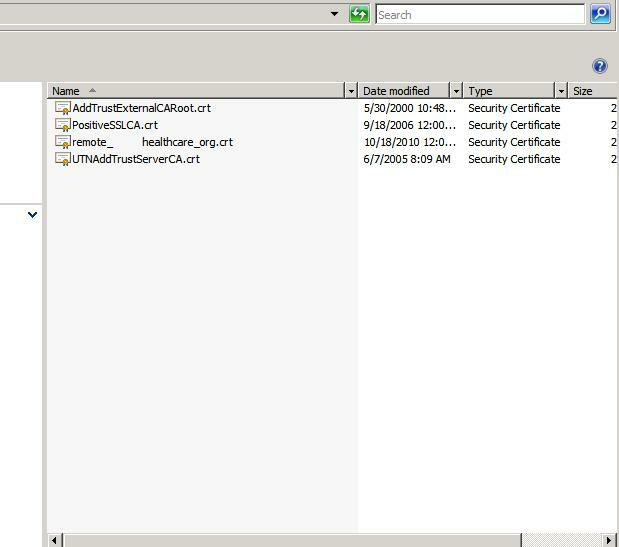 Go back to the Add a Trsuted Certificate Wizard, and click next. You will see boxes to enter your certificate information. I then follow a link in my email, oto make sure I am adding these correctly. I am not sure which cert is which, so Ill read up. The how to is here. 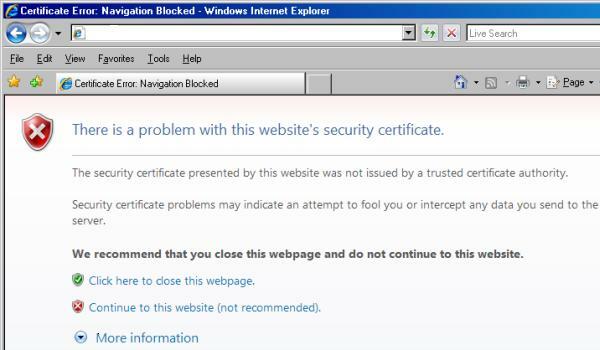 So I open IIS 7, click Server Certificates, and browse to my new files on the desktop. They are not in .cer format, so the wizard does not see them. Wait a minute…. forget Comodo’s how to guide. 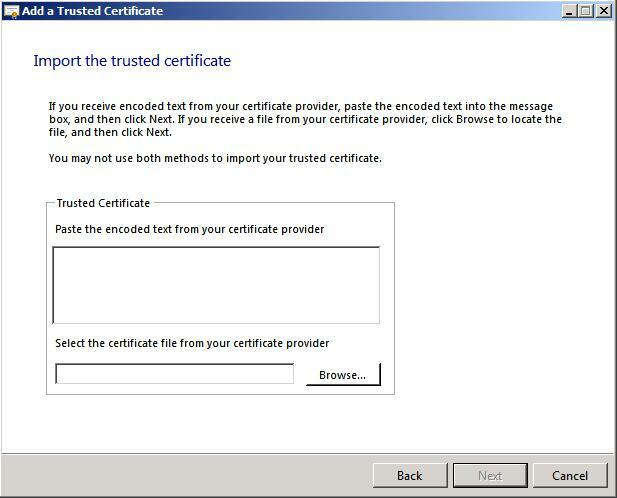 Let’s go back to the Add a Trusted Certificate Wizard from the SBS console. Select Locate file. Click on the correct cert. this cert will be your domain name .crt. Mine is remote_blankhealthcare_org.crt. Click that file, click next, and watch the wizard complete. Alternately you can copy the certificate text from the end of the email, and place it into the box provided instead of choosing the file. When you head back to the connectivity tab of the SBS console, you will now see your certificate status as trusted- that means it is working correctly. There are 3 other certificates included in the zip file, let’s add those now. To do this, click Start>Run. type mmc.exe. When the MMC opens up, click file, Add/Remove snap-in. Click Computer account and Finish. Right click Intermediate Certificates, and select All Tasks>Import. Once selected hit next until the wizard finishes, you shouldn’t have to change anything. You will also import your Root CA certificate, but instead of into Intermediate Certificates, Import this one into Trusted Root Certification Authorities. Now reset IIS and lets check it. Start>Run>type in iisreset. Now navigate to your site. Once on the site, click the lock next to the address bar. Click view certificate. 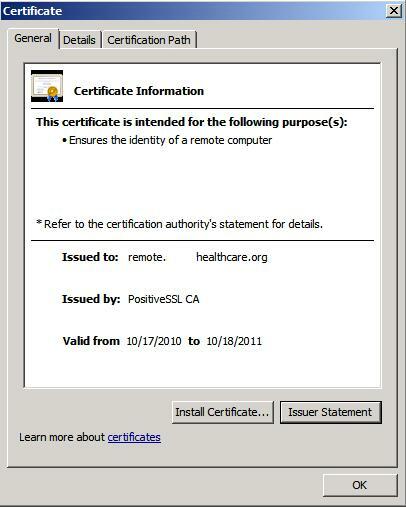 the certificate should be listed as issued by Comodo and should be named PositiveSSL. Now Comodo offers some other stuff with the certificate for free, let’s set that up quickly, and also backup our certs and private keys so that if we crash we can reset this. You can sign up for HackerProof on the site linked in your email. I will opt to not sign up, as it seems a PC scan. I do not want a web service scanning my server, which already has antivirus anyhow. Lets backup our Private Key, then our Certificates. To back up your certificates, I suggest adding them to a zip file. Encrypting that zipfile with a backup. Then placing this zipfile on an encrypted and secure drive, preferrably offsite. To export your private key, go to certificates mmc. Drill down to the certificate you just installed. Right click and select Export. Include private key and anything else you wish. Password protect it, and save it in a secure location. You can insert the SSL Site Seal into your web site if you wish. I added mine to my background image, and disabled the link. EDIT: The SSL package that we just installed is the positiveSSL, which is the basic package for a SSL Certificate. Included in the $9.95 purchase is the EVSSL, Extended Validation. This must be completed by printing the two forms in the email. You must sign and enter your incorporation data, then fax them to Comodo. They will then validate your company, and issue you another more secure SSL, which can be installed the same way. This will give you the green security bar and lock icon.